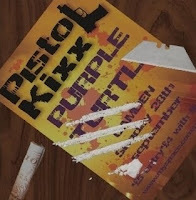 The latest issue of Nightshift just came out and features a review of the PISTOL KIXX live ep. It does make me a bit sad to be getting such good press after we broke up, but hey, these things happen. You can of course buy the glorious "Live in Camden town" EP on cd for a pittance + P&P HERE . Or if you feel like downloading it you can get the whole thing for free at last.fm. Still, it's nice to end on a good note I guess and the new band will start rehearsing in a week or so, so it's all good! Rocks. That’s all part of the fun. Because let’s not deny that Pistol Kixx are fun. have missed that particular meeting.